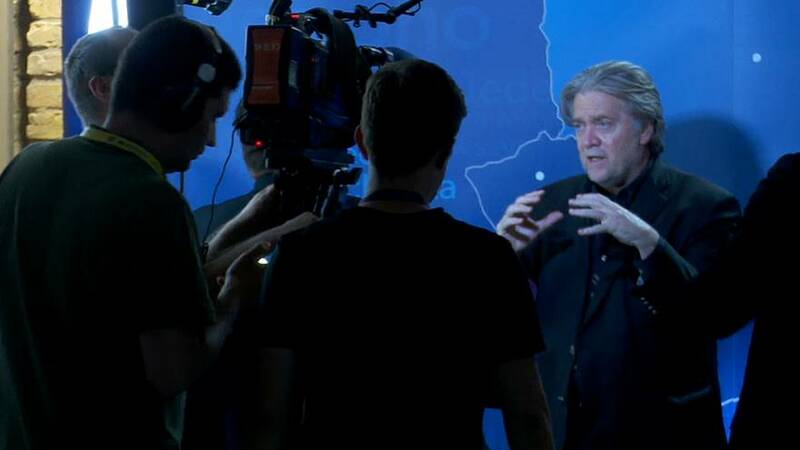 Donald Trump's former chief strategist Steve Bannon giving an interview to Hungarian state TV. He was in the country to give a speech in Budapest at the invitation of several groups supportive of Prime Minister Viktor Orban, whose Fidesz party is fiercely anti-immigration. The lecture was promoted as an analysis of Donald Trump's America First policy, and its effect on Middle Europe, something that would resonate with his hosts. It is reported that several Hungarian and international media outlets were refused entry due to lack of space, although mobile phone footage from the event showed evidence of empty chairs. Our correspondent Robert Csakany said it was like a rock concert where the performer sings all his farvourite songs but refuses to address the audience. The only time Bannon was really applauded loudly was when he said that Hungarian pm Viktor Orban was "Trump before Trump". He spent most of the time explaining that the so-called elites are the most corrupt and most incompetent people to lead society. No cameras were allowed in the room.